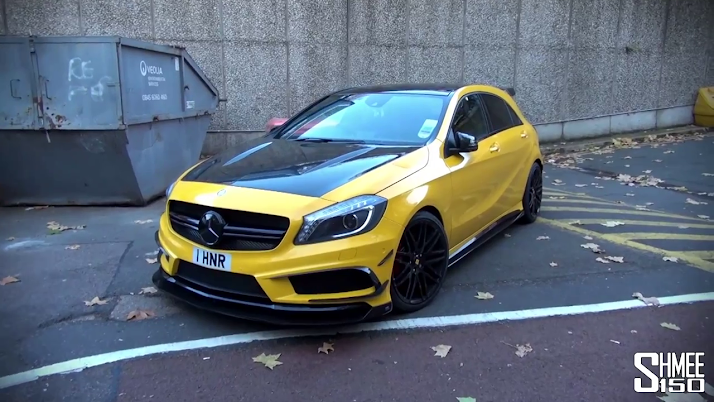 The Mercedes-Benz A45 AMG is a very brilliant car, whether in the performance or in the looks department. This particular model received extra love from its owner with a RevoZport body kit, a carbon fiber front hood and BRABUS alloy wheels. The car is wrapped in yellow which makes a nice contrast with the red brake calipers and the red interior. When it comes to the engine, the car keep the original 360 Hp inline four from the A45 which is fairly enough. It doesn't sound as good as this modified model but it's still a very nice little car! Video by Schmee150 after the jump.